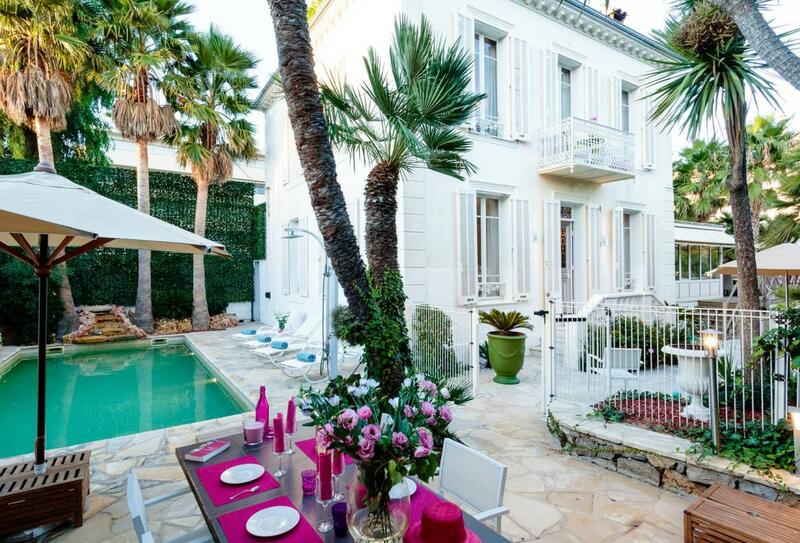 The beautiful art deco villa “Val des Roses” in Cap d'Antibes is a true delight. Set within spacious Mediterranean gardens, its private heated pool offers guests the peace and quite they are looking for, and yet you are only a few steps away from the Azur-blue Mediterranean and its sandy beaches. 5 ensuite bedrooms, aircon and WiFi throughout. independent house features a further 2 suites making it a total of 5.
style dining area with table to seat at least 10 people. This leads through to the kitchen and large patio doors then lead out onto the decked terrace, which has sea view and where there is a BBQ, a lounge area, dining seating for 13 and sunbeds. fridge with water cooler and icemaker, large gas oven, microwave, dishwasher. Separate utility room with x2 washer/dryer machines. 2 highchairs and 2 cots available. Small office type room on ground floor. The 3 bedrooms suites are on the first and second floor of the house. pillared bath with shower, double wash basin in slate and wood, flat screen television and airconditioning. Small table and 2 chairs. First floor. Ensuite marble bathroom with feature corner bath. Kingsize bed and single bed, two small balconies one with table and chairs, awning and sea view, ensuite area with rolled top bath and wash basins in slate and wood within the suite, separate toilet, flat screen television and air-conditioning. Second floor. Kingsize bed, view of lighthouse in Cap d’Antibes, ensuite with corner bath and shower, washbasins in slate and wood, flat screen television and air-conditioning. First floor. facilities and living area as well as storage areas. INDEPENDENT HOUSE with 2 separate suites. toilet, marble and wood double basins. Airconditioned. Flat screen TV. Heated swimming pool of approx 9.5m x 4m and with a water feature. Summer kitchen by the pool with a gas BBQ. Newly installed heated swimming pool with small waterfall, terraces, sun loungers, seating areas, outdoor shower. Excellent location 50 metres from the Salis sandy beach of Cap d’Antibes and 10 minute walk into the Old Town of Antibes with its Provencal market (home delivery possible), Picasso Museum, artisanal shops, galleries, restaurants and bars. 15 minute walk to Juan les Pins with its beaches, restaurants, bars, nightclubs and Casino. A great choice of restaurants at walking distance, Sailing club/small port within 200 meters. Cannes is 15 minutes by car. Train from Antibes to Monaco is 40 minutes. Looking towards Cap d'Antibes, lovely private beach with lounging areas for coffee and cocktails and a restaurant serving a wide range of salads, pasta, meat and fish. Only a five minute walk from the villa towards Vieil Antibes. Bd du Marechal Leclerc, Antibes. Tel: 04 93 67 14 06. On the Salis beach, a 30 second walk from the villa, family run beach kiosk established in 1965 selling high quality snacks to take away. Salad nicoise, tomato and mozzarella salad, pan bagnat (provencal style tuna sandwich with anchovies and olives) with a secret family recipe are all specialities. Plus the best hot dogs in the world. Lobster, king crabs, prawns and oysters, whole grilled fish and fish paella are all specialities. High quality traditional mediterranean cooking. Menus and a la carte. Restaurant open every day non-stop from 12 noon to 10.30pm. Tel: 04 93 34 33 54 Website: www.restaurant-albert-1er.com. On the corner of the coast road and bd Albert 1er. A five minute walk from the villa. A little address tucked away on the beach road where the locals go. Family run, typical French cuisine, unpretentious and reasonably priced. 28 Boulevard Marechal Leclerc Antibes. Tel: 04 93 61 57 29. In an underground cave near the market in Rue Sade, this bar (and museum of all things absinthe during the day) serves absinthe and wines in a convivial atmosphere with pianist and all styles of quirky hats to try on and pass around. 25 Cours Massena, Vieil Antibes. Tel: 04 93 34 93 00. Wine and champagne bar serving quality wines and delicious tapas in the old town just down from the market walking towards the port. VILLA VAL DES ROSES TO SANCTUARY DE LA GAROUPE. A short walk along the Salis beach to the little port then take the pilgrims' path 'Chemin du Calvaire' up to the Garoupe plateau and the orientation table, the marine themed church, lighthouse and beautiful panoramic views of Antibes and the Cote d'Azur. VILLA VAL DES ROSES ALONG THE RAMPARTS TO THE PORT OF ANTIBES. Take in the atmosphere of the Old town of Antibes along the ramparts then stroll around Europe's largest private port with hundreds of yachts and boats some up to 50m long. PLAGE DE LA GAROUPE AROUND THE COASTAL PATH OF CAP D'ANTIBES. From the far corner of the Garoupe beach, a much longer stunning coastal walk (3.7km) running alongside the walls surrounding the great parks of the private properties 'chateau de la Garoupe' and 'chateau de la Croe', around rocky headland and small creeks right around to Villa Eilenroc with a view of 'billionaire's bay'. Leave the pine grove of Juan les Pins, pass the Belles Rives Hotel, wind along the coastal road past Port Gallice to the pretty coloured fishing boats in Port Olivette. Water-skiing was invented in Juan les Pins so where better to have your first lesson or perfect your technique. Available from 7am from the pontoon of the Belles Rives hotel. Upward parachute sailing, ski bus and paddle boards are also available. Hotel Belles Rives 33, bd Edouard Baudoin. Tel: 04 93 61 02 79. The Picasso museum was home for six months to Pablo Picasso in 1946 and the museum is the first in the world to be dedicated to the artist. Picasso donated many works including paintings, drawings, ceramics and etchings. The museum also houses a room of paintings by Nicolas de Stael who became familiar with Antibes during one of his most creative periods. Also works by contemporary artists including: Leger, Magnelli, Ernst, Modigliani, Hans Hartung and Anna-Eva Bergman. The sculpture terrace and view is spectacular. Chateau Grimaldi, Place Marejol, Vieil Antibes. Tel: 04 92 90 54 20. Closed Mondays. The museum holds the archeological collections of Antibes from city excavations and the sea floor. Reviving a glorious past, ceramics, amphora, mosaics, money and objects from daily life can be found from Etruscan, Greek, Phoenician and Roman ships. Bastion Saint-Andre, Vieil Antibes. Tel: 04 93 95 85 98. At the tip of Cap d'Antibes, on a superb plot of 11 hectares, Villa Eilenroc is a beautiful residence symbolizing the luxury and voluptuousness of the Belle Epoque. It was built in 1867 following plans by Charles Garnier, the architect of the Paris and Monte Carlo opera houses. The park surrounding the villa is planted with traditional species of the Mediterranean landscape. At the heart of this conservation area, a public rose garden offers the fragrances and essences of its thousands of varieties, mostly created in Antibes Juan-les-Pins, the capital of roses. Open Wednesday and Saturday afternoons in high season. Impasse Beaumont, Cap d'Antibes. Tel: 04 93 67 74 33. Manicures, pedicures, waxing and massage at the salon or at the villa. 2 av Lemeray, Antibes is a 10 minute walk away. Book 48hrs in advance and ask for Dominique. Tel: 04 93 34 79 75. Dessange is a high quality, long established French hair and beauty business and the official partner of the Cannes Film Festival. Their extensive salon and spa in Antibes can be found at 6 Boulevard Wilson. Tel: 04 93 34 43 12. Open until 7pm Monday to Saturday. Established in 1911, this is an exceptional address offering canapés, salads, buffets, hot and cold starters, main courses and desserts including: foie gras, terrines, salmon, scallops, duck with orange, lamb confit, chicken with purée truffle, creme brûlée, tarte tatin, raspberry pana cotta, the menus are mouthwatering. Visit at 21 rue de la Republique, Old Antibes. Tel: 04 93 34 09 52. For large orders they can deliver to the villa. Lovely boulangerie less than five minutes walk from the villa along the coast road at the roundabout going towards Old Antibes with a quality range of bread, croissants, pastries, cakes and many savoury specialities. 28 Bd Marechal Leclerc, Antibes. All available to eat at their cafe on the terrace or to take away. Tel: 04 93 61 40 43. Tucked away in the old town near the Provençal market Claudie and Marie make and sell the most delicious home made ravioli and pasta and wide selection of Italian antipasti and meats. Not to be missed. 5 Rue Sade, Vieil Antibes. Tel: 04 93 34 03 43. Fresh fruit, vegetables and salads delivered to the villa. Website: www.golfe-fruits.com Tel: 04 93 63 87 82. High quality seafood platters, the best of the sea, can be delivered free of charge to the villa along with seafood pasta and paella and homemade fish soup. Tel: 04 93 34 33 54 Website: www.restaurant-albert-1er.com. On the corner of the coast road and bd Albert 1er. A five minute walk from the villa. Supermarket: Monoprix, Place General de Gaulle, Antibes (15 minutes walk from villa). You can shop here and they will deliver your purchases. Visited by our team in March 2017 - very highly recommended. Taxi to Cannes is only 15 minutes and shuttles run for the MIPIM convention. Breakfast and cleaning can be provided for corporate stays. Long term lets welcome from November to April. Regarding cleaning, Villa Val des Roses will organise a professional cleaner on your departure, total cost 300€, which will be taken out of the deposit along with any other agreed charges. The pool’s chemical and backwash treatment (not the picking up of leaves etc in the pool) is included in the rental. The maintenance/cleaning of the terraces, parking area, cushions are not included and shall be done by the tenant. 8 weeks prior to the rental the remaining 70% charge is payable along with a 30% damage deposit with a minimum of 1,600€. The damage deposit will be returned after the rental should there be no damage and after cleaning costs (300 Euro), gas and electricity charges for the rental period have been taken off.